The table below represents the ICAR-certified combinations of AMS (automatic/robotic milking systems) and sampling shuttles or trays. As outlined in the National DHIA Uniform Operating Procedures, data collected for DHI programs must be from an ICAR-certified device. These certified combinations are based on official ICAR-testing of the specific combinations that were conducted at one of the ICAR Test Centers. For reference, the ICAR guidelines identify that the certification of a recording device includes testing the specific combination of the AMS and sampling shuttle or tray (please refer to ICAR Guidelines Section 11.4.4 Automatic milk recording systems). Therefore, ICAR certification is restricted to the specific combination only, not to the individual components of the combination. The certification of an AMS model or version with a specific sampling shuttle/tray does not extend that approval to later versions or models of the AMS system from the same manufacturer. Likewise, the certification of a later or alternate version of a sampling shuttle/tray with earlier versions/models of an AMS system is not automatically extended and requires either review or a modified ICAR test to ensure delivery of representative milk samples. Further, there may be specific modifications to either the AMS or sampling shuttle/tray required as part of the ICAR-certification of an AMS and sampling shuttle/tray combination. These modifications may include physical changes to AMS components, adapters for sampling shuttles, and/or software upgrades. 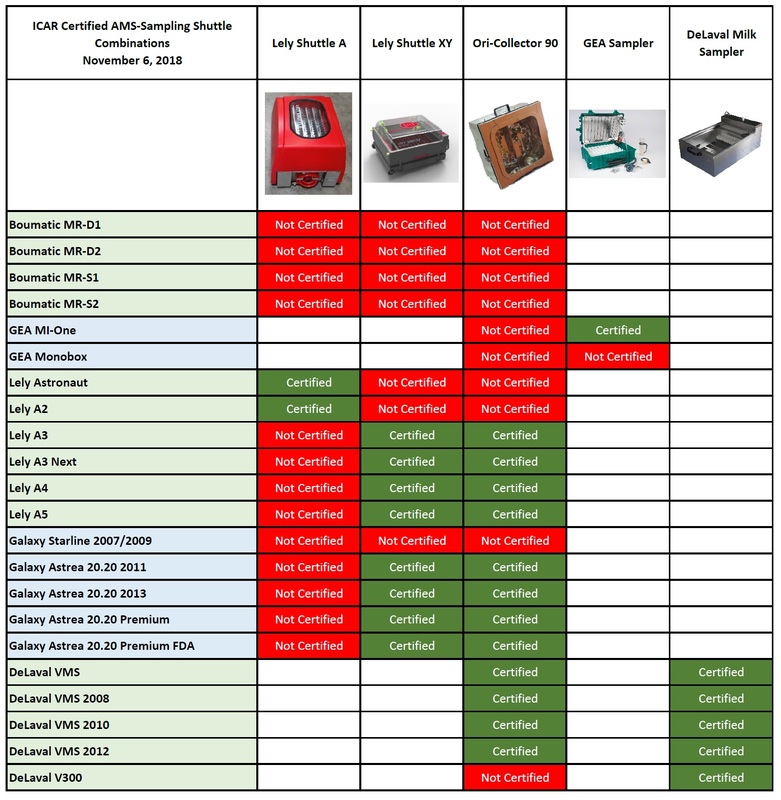 ICAR-certified AMS and sampling shuttle/tray combinations. Those combinations that are blank indicate that the AMS and the sampling shuttle are not functionally compatible. Please click on the picture for a printable PDF of this matrix.